internet blog buddies - she has reallllly fabulous projects herself (like this one that i featured), so i encourage you to check her blog out. janell was also on the nate berkus show last friday - how cool is that? she did a little diy project with nate at the end of the show, and it was really cute and fun to see someone you read about on tv! 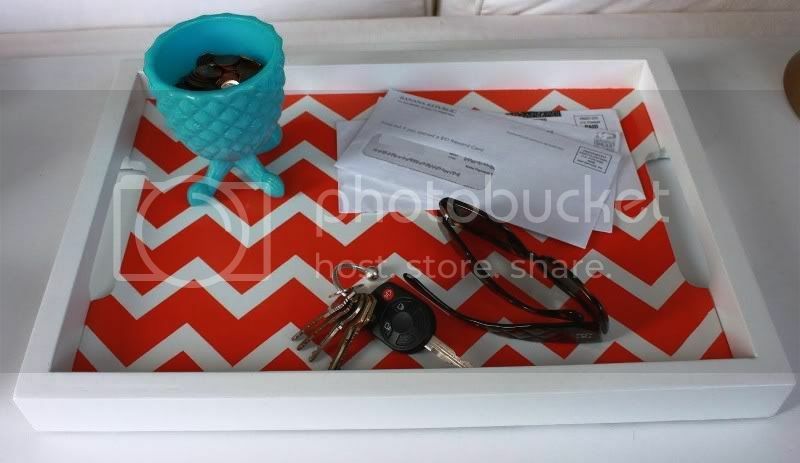 anyway, thanks, janell...and check out this super cute chevron tray that was also featured - i love it, and am definitely a new fan of the "everything LEB" blog! that was a great call. i am considering having a permanent stencil of my morrocan pattern made, too...the cardboard version is probably not going to last too much longer! I need to get to the store and get myself some stencils and paint- you are amazing with a paint brush!! Ok off to spend the rest of my day reading your blog and dreaming of my next paint project. I am really enjoying your blog. I'm so interested to see what you're working on/painting next!! Keep it up.